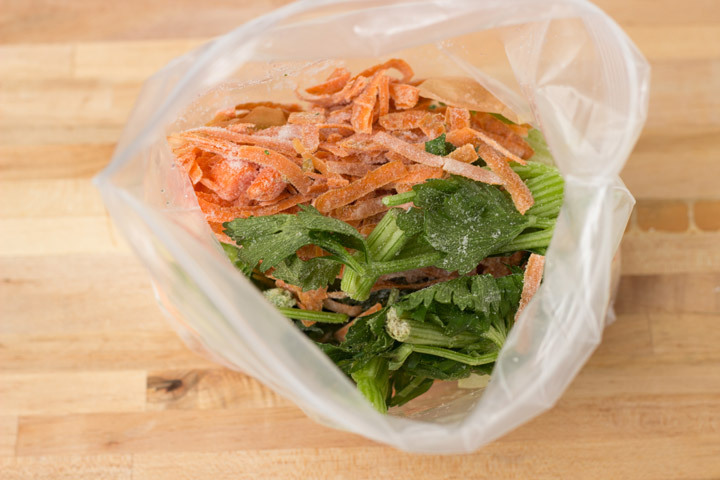 In your freezer, keep a gallon-size zip-top bag to store all of the trimmings from your veggies including onion peels, carrot skins, celery tips, potatoes, greens, garlic, and herbs. Once the bag is full, wash then cover everything in a big pot with water. Simmer for 30-45 minutes, then strain, cool, and store in your freezer. All of the throw-away parts actually contain a ton of flavor so reduce your waste and get the most bang for your buck by saving them and making your own stock. Unlike chicken stock, which requires several hours of cooking time, vegetable stock needs no more than 45 minutes to become richly flavored and delicious.